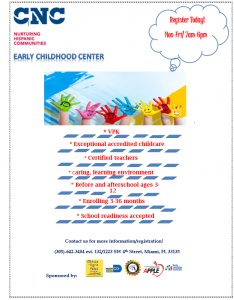 CNC offers a FREE after-school program for your children! 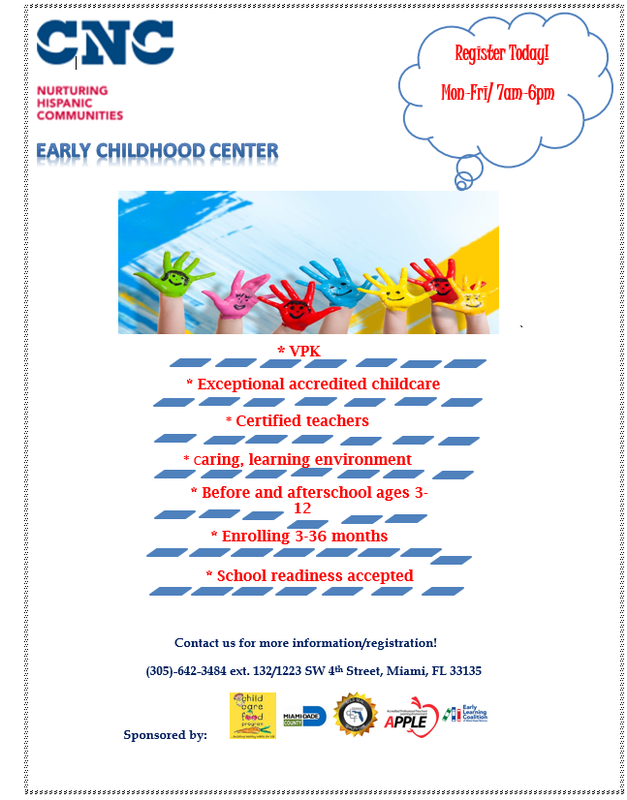 Starting August 20, 2018, The CNC Learning Enrichment Program takes place at the Alpha Charter of Excellence School and supports children with homework assignments, intervention and instruction in reading, mathematics, and science, use of technology in all core content areas, art, and cultural enrichment fieldtrips, among others. Join us May 11, 2018 for CNC – Cuban Heritage Night! Join us for CNC – Cuban Heritage Night! Celebrate Cuban pride in the heart of Little Havana. Purchase a bundle ticket package for the Florida Marlins vs. Atlanta Braves game, and you will receive an exclusive Cuban Heritage jersey and help CNC’s work in the community. Don’t miss out on a fun night! Purchase your tickets on the link below. 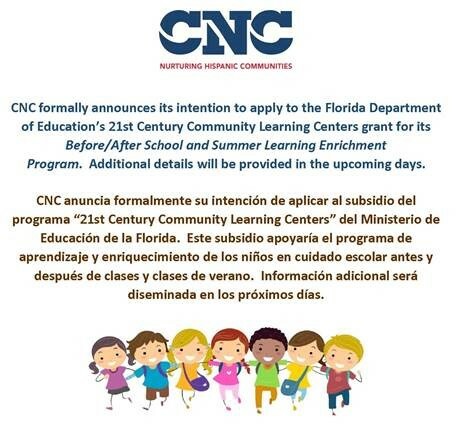 CNC formally announces its intention to apply to the Florida Department of Education’s 21st Century Community Learning Centers grant for its Before/After School and Summer Learning Enrichment Program. Additional details will be provided in the upcoming days. CNC anuncia formalmente su intención de aplicar al subsidio del programa “21st Century Community Learning Centers” del Ministerio de Educación de la Florida. Este subsidio apoyaría el programa de aprendizaje y enriquecimiento de los niños en cuidado escolar antes y después de clases y clases de verano. Información adicional será diseminada en los próximos días. On August 9, 2016 Ford Motor Company along with First Book Organization had a reading party at the BB&T Center located in Sunrise, FL. It was an incredible event where children from CNC Early Childcare Center and Treasure Island received the opportunity to tour the hockey stadium and receive a free gift which included a backpack and a book. The children enjoyed the day reading with volunteer readers and spent the day filled with fun activities. Our own, Sonia Lopez-President and CEO, was a volunteer where she read the book “I’m Cool” to a group of children. In the U.S. no matter how formats and technologies change, children from low-income families will still need access to rich and varied content. 1 book is given to 300 children. This was a wonderful experience for them to have, it shows them the meaning of what reading is and gave them a chance to receive a book of their own. Take a look at our 2016 VPK graduation pictures under Publications/Photo Library tab! Every grad has worked hard and have learned through games, activities, and fun! The CNC Health, Safety and Wellness Fair is the annual fair organized by CNC in Miami-Dade County informing communities about the connection between nutrition, fitness, safety and wellbeing. Taking place on Saturday, October 15th 2016 at the Marlins Park from 9:00 a.m. – 3:00 p.m., this fair is a free family event, open to the public and is attended by an average of 700 individuals. The Fair serves the needs of the underserved local community and aims to facilitate healthy living to all families through education. Save the date for this family-fun packed event! 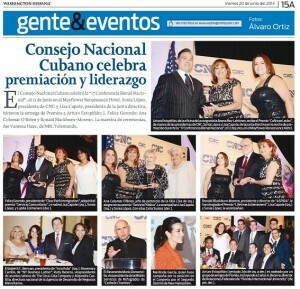 Visit our Fan Page: www.facebook.com/cncorg for 2013 event photos. Get Closing Cost Assistance Toward the Purchase of Your Next Home. Complete CNC’s FREE, HUD approved, homeownership education series of workshops, and you will receive a coupon offering 3 percent in closing cost assistance toward the purchase of an eligible Freddie Mac-owned home within one year of completing the workshops. Don’t miss this FREE opportunity to learn more about how to purchase an affordable home in your neighborhood. Space is limited, reserve your seat today. Call 305-642-3490. On behalf of CNC and our Board of Directors, THANK YOU for joining us at our 17th Biennial National Conference “Latinos and the Americas: Engagement and Opportunity” this past June in Washington, D.C. This year’s conference featured two full days of enlightening conversations, business luncheons, an opening reception, a pre-banquet reception, and an awards gala banquet. We had the privilege of hosting high caliber moderators and speakers, who displayed their expertise, provided meaningful insight, and provoked engaging plenary dialogue. We honored leaders for their outstanding and tireless service to improve our communities, and paid tribute to the five branches of the United States Armed Forces, who protect our freedom every day. Anchor – “Aquí y Ahora”, Univisión Communications Inc.
My heartfelt gratitude to our CONFERENCE SPONSORS who support our programs and believe in our mission. This successful event could not have been possible without your unwavering commitment! TO OUR MODERATORS, SPEAKERS, AWARDEES, PUBLIC OFFICIALS, ARMED FORCES AND PARTICIPANTS: THANK YOU for enriching our conference program and making our conference such a memorable event! Until next time, ¡Un afectuoso saludo! On June 11-12, CNC convened its 17th Biennial National Conference in our nation’s capital at the Mayflower Renaissance Hotel. In its usual fashion, the conference hosted four plenaries that embodied this year’s theme, “Latinos and the Americas: Engagement and Opportunity.” The conference also recognized prominent Hispanic community leaders at its signature awards gala banquet.